This is outstanding, Sarah! I love it! You incorporated so many parts of the story, and I'm happy you left out the witches. What a beautiful work of art! Oh Sarah, this came out absolutely amazing. 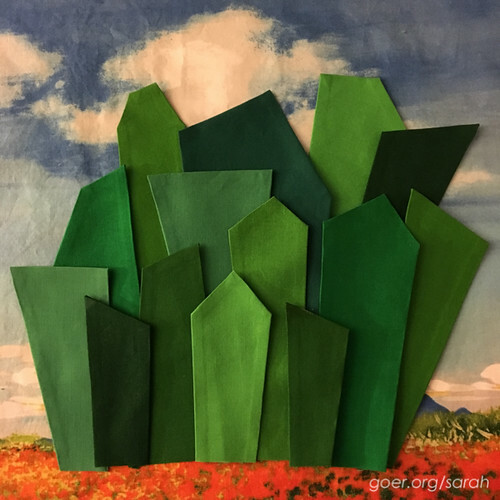 I love how you appliqued the abstract Emerald City (it really does look like the Emerald City!) and the rainbow is the perfect touch. I'm sure it will be well loved! Beautiful! Absolutely beautiful!! 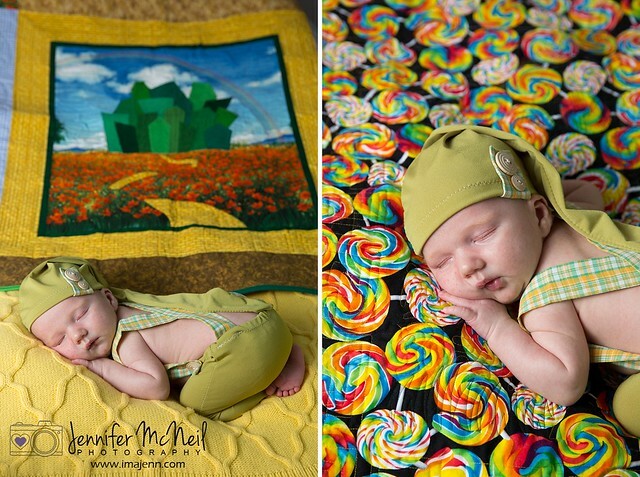 Thoroughly enjoyed your write-up on what steps were taken to make baby Jordan's quilt. The pictures of baby Jordan at the end were a nice surprise! 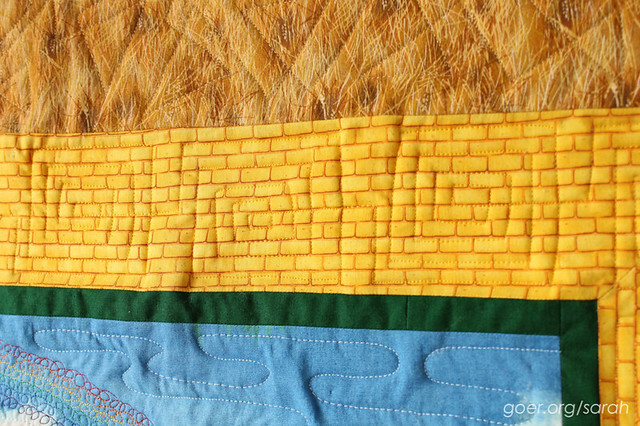 This Wizard of Oz baby quilt was so worth the wait. Thanks for sharing!! What cuteness! And not just the baby. 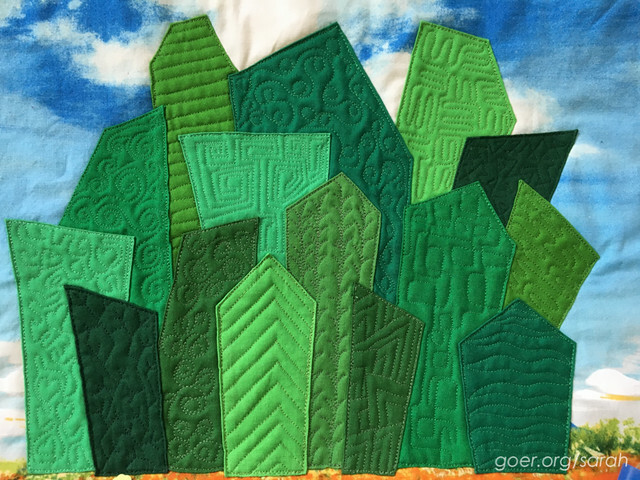 Love the layered Emerald City with the different quilting motifs on each one. Beautiful! Thanks for linking up with TGIFF! 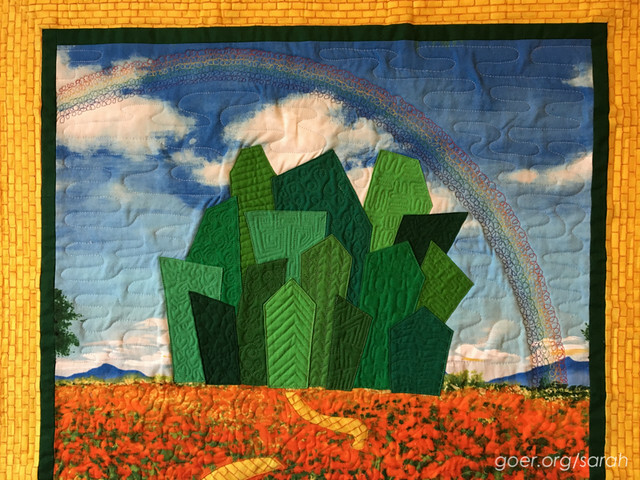 This is really good, i like your "independent" way to make this quilt. The wizard of Oz ist not very popular or well known in Germany, but i read it to my son and he loved it. 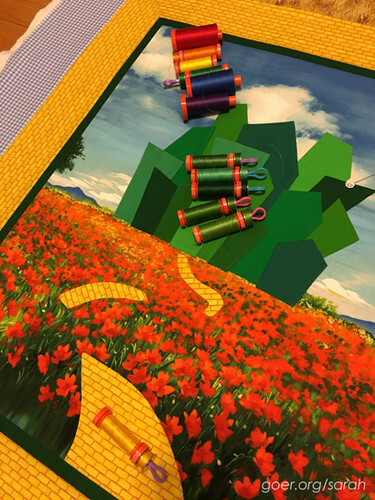 Your quilt captures the story so well! Thank you, Jana. I didn't realize how much my sister has always loved the story. Since my kids (nearly 4 and 6) have seen the baby's room and knew about the quilt they got interested and we just finished reading the book which they really enjoyed. I hadn't read the book since I was 7. It was fun to read it again. Now, I can't wait to watch the movie with them! This looks amazing!! I loved seeing your design process, all the fun accent details & quilted texture fun!!! First off, Sarah, it's an amazing work of art so obviously filled with love. The little touches like the borders for each character and the icons you quilted absolutely delighted me. 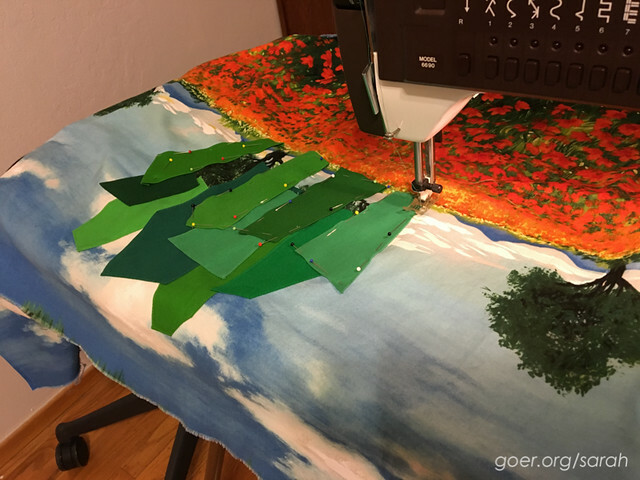 I also very much appreciate your statement about refraining from asking for too much input and proceeding with your vision for this quilt. 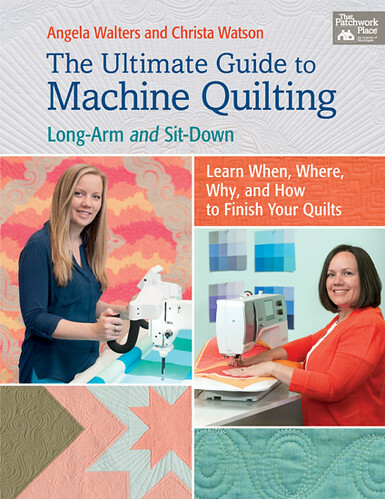 I definitely plan to buy The Ultimate Guide to Machine Quilting based on what you wrote and how useful this book was to you. And finally, it's obvious based on the photos of Jordan with the quilt, that you are not the only artist in the family. I really enjoyed reading this blog post. Take care, Mary. Thank you so much, Mary. It was so hard not to share on the blog/IG as I worked on it. It was good to have a few friends to share near peeks to so I didn't go crazy. :-) Enjoy the book. It's full of great inspiration and tips. It turned out wonderfully and thank you so much for sharing the design process. 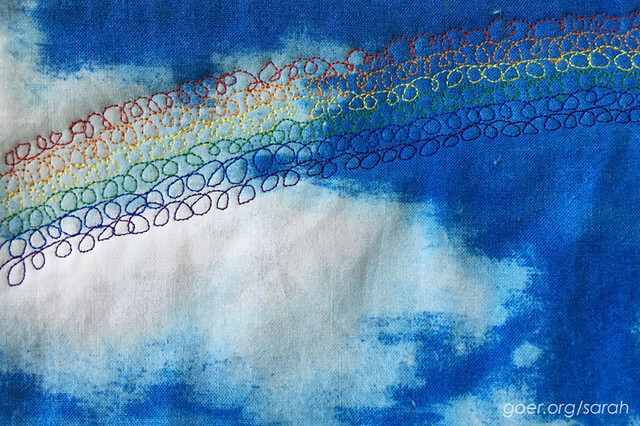 I like especially the representation of the main characters in the fabric borders. And Jordan is adorable of course. Just stunning Sarah!! 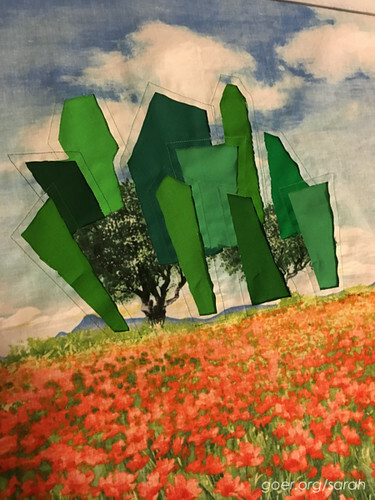 I love everything about it and great to hear how you went about creating it. I haven't come across this book yet but will keep an eye out at the Quilt Show I am visiting in a couple of weeks. Sarah, I think this is so darling and original. I love how you captured the characters and they're desires. Love all the quilting, so much variety. This is just lovely. My favorite would be that rainbow. Great job on this quilt! Thank you, Stephanie. I just love the rainbow, too. I'm so glad it came out as well as it did. What a fabulous quilt! 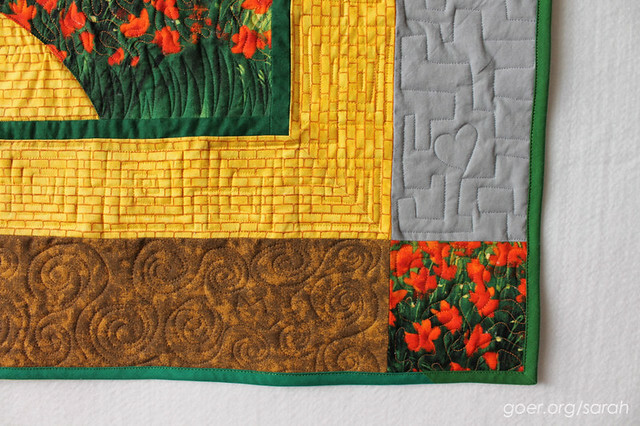 I love all the detail shots showing how you quilted the different areas with different motifs. This makes my day!! Thank you, Christa! I had a great time! Your Wiz of Oz is a work of art, it's amazing. This is just wonderful. 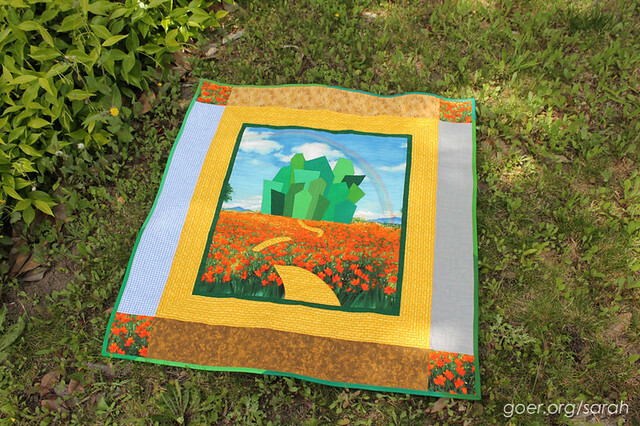 You found the perfect fabrics to create the story within this quilt. 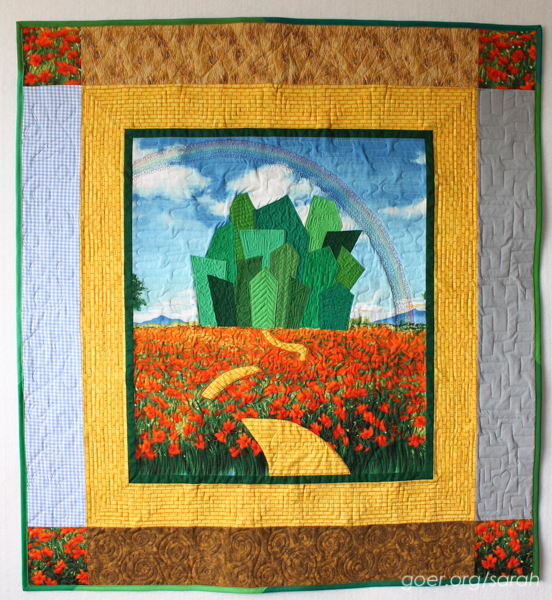 The poppies are so pretty and they way you did the yellow brick road is great. 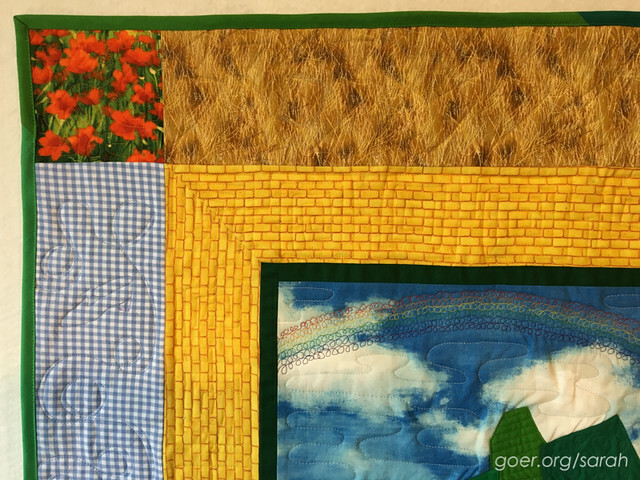 Love the thought that you put into the quilt motifs and how you included as many parts of the story as you could. Just all around excellence! Thank you so much, Bernie! It was a bit like a scavenger hunt. This is such a sweet quilt, but to see it with your nephew really just melts my heart. 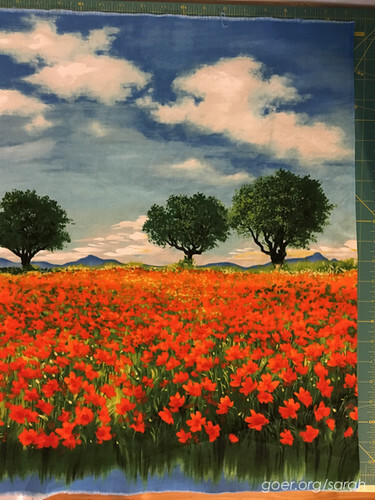 That poppy panel is so perfect, and well done on making the Emerald City to cover the trees. I also have to admit that I was worried I had accidentally "unfollowed" your blog the other day and checked to make sure I wasn't missing your posts; I've missed your voice in blogland (so this is my way of saying I hope all is well). The blog has been on the back-burner for the last while. Thank you so much for your message. It means a lot to me. Thanks for visiting! 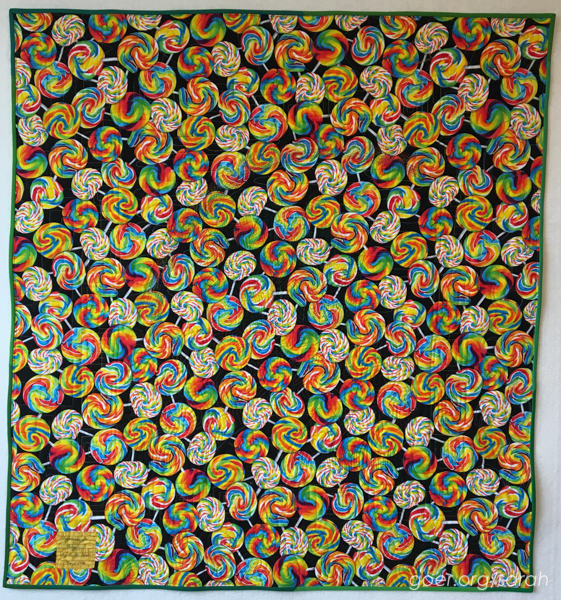 Really lovely quilt, you put so much thought into it and it shows. 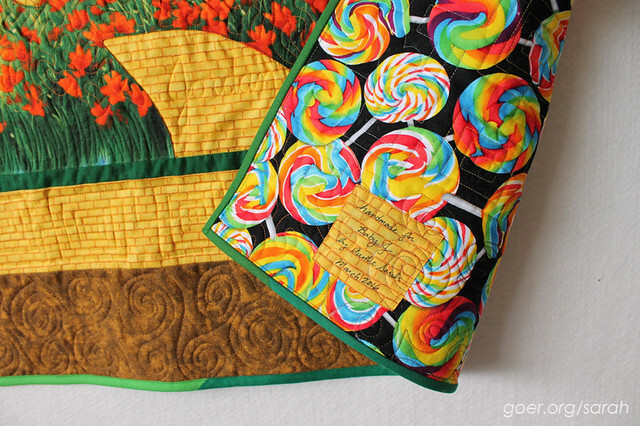 My favorite part is your quilted rainbow across the top - great touch! Holy wow! Sarah!!! This is amazing. I think my favorite part is the nod to the characters. You put so much thought into this. I'm sure it's going to be very special to your nephew in the years to come. Thank you, Sarah. I really had fun with it. Such a fun theme to work with! Sarah, I was wondering if I could commission this quilt from you with a few minor changes and how much would it cost? Lianne, thank you so much for your interest in my work. 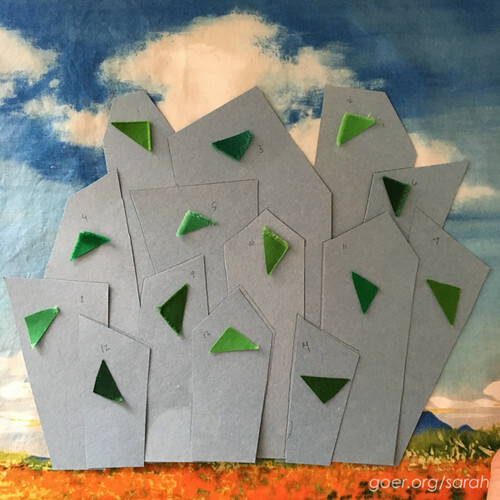 I do not make commission pieces, though you are welcome to point another maker to my blog post for inspiration. If you find someone else to make the quilt for you, I'd love to see it once it is complete. Best wishes!